Preheat oven to 375. Finely chop pistachios in food processor. Add flour, sugar, baking powder and salt and mix. utter or cooking spray 24 mini muffin tins. Fill each 2/3 of the way with batter. Sprinkle remaining finely chopped pistachios on top. 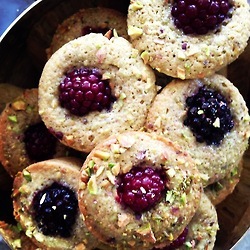 Plunk a berry in the center and bake for 12-14 minutes.